It's FC Cincinnati, of course this season matters. It’s a professional league, professional players, and they are playing soccer representing our city. This is a silly debate to have. If you are a fan of a sport, and there is a professional team of that sport that is supposed to represent you, it matters. You’re allowed to be invested in the outcomes of games. You can criticize the coach for his decision- making. You can be frustrated with players when they fail to perform. In fact, you should absolutely be invested in FCC's final season in USL if you want to claim to be a fan. Right? Well it turns out, this season doesn’t actually matter. Especially since the MLS announcement, this season has become a lame-duck season. The vast majority of this team is probably not going to be here next year. Coach Koch? His position is already secured for the coming move to MLS. The stakes are minimal if they exist at all. If FC Cincinnati manages to lose every single game for the rest of the year by 5 goals, nothing changes next year. Koch will still be in charge, and the chosen few will make the cut on the new roster. So you shouldn’t get too invested in the games, and just enjoy the process. Which is a fine perspective to have if you don’t actually want to be a fan. If the results on the field don’t matter because things are happening next year anyway, should next year’s season matter? The team will be an expansion side which means the expectations will in the dirt. 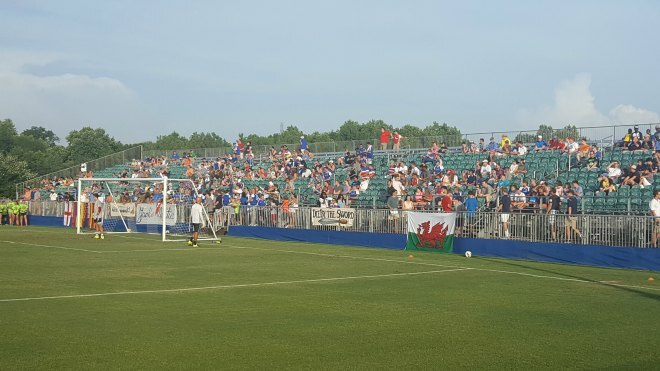 FCC will be playing in a temporary stadium and still learning the ins-and-outs of GAM, TAM, and Young DP allocation draft slots (that last one is, probably, not a thing). So if you’re looking for excuses not to care, you probably shouldn’t care next year too. And if you’re looking for entire seasons to stop caring about the team, perhaps you should go be a fan of a “rebuilding” baseball team. But the reality is, living with the ups and downs of every, single, moment of this team is objectively not worth it. Like, on a scale of 1-10, how mad were you that the team blew a two goal lead and tied Toronto II, the worst team in the conference? Maybe, a 4? A 3? It’s disappointing for sure, but is it worth firing off angry tweets to the ticket staff threatening your season tickets over? Absolutely not. The suggestion isn’t that you should not care at all about the team and their performance this season, but to keep in mind that you don’t need to lose your mind over every little thing that may be going wrong. In fact you should probably start to pay more attention to rumors like the Ecuadorian star that may have signed with MLS but they haven’t mentioned which team. Hmmm. But we don’t give “passes” to the Reds for their horrendous seasons. And we sure don’t give the Bengals the benefit of the doubt. Marvin Lewis is absolutely hated in this city, despite being a regular in the playoffs. And the fact that his two best teams, likely Super Bowl winning teams in 2005 and 2015, both lost their MVP-caliber quarterbacks in the playoffs. Anyone want to give Lewis a pass? Bah! So why on earth would you let FC Cincinnati, a team that stacked its roster with lower-division all-star talent, get away with struggling in a league it has been designed to burn down? Yeah, if Koch makes a poor decision, why would you hold back? This is city ran Bryan Price out of town, from a Reds team even the management said wasn’t trying to win for a few years. FC Cincinnati deserves no pass. It’s the USL. Let’s be honest, it is minor league. And since the team is moving to MLS, there really is no point in caring about a minor league season. If FC Cincinnati wins the USL championship, are we going to throw a parade? Are you going to tell the grandchildren about the day FC Cincinnati beat the reserve team from "Real" Salt Lake to win the championship in front of 1,500 people in Zions Bank Stadium? Probably not, no. It’ll be great to win the league no doubt, but winning the USL is like having the world record for most rotations while hanging from a power-drill; technically an achievement but probably one you leave off the resume. Worthy of a star over the crest on an MLS kit or just a neat bit of trivia in 20 years? At the end of the day, if you’re a fan, you are going to find yourself invested. You’re going to get mad about something and yes, you’re going to be excited to win the title. Frankly, it’s crazy that people don’t care more about this season. The way it has been set up, FC Cincinnati should be rolling the league and should have made a deep run in the Open Cup. We lost on penalties to an MLS team, but a bad MLS team. This team was designed to win, and win everything. Now that we’re out of the Open Cup, it’s time to make sure the league has nightmares about having to play Cincinnati. If we don’t run this league and take a title on the way out, this year can go down as a failure. And as a fan of Cincinnati sports, it is time we finally stopped failing. So what do you think? How much should fans care about this season?